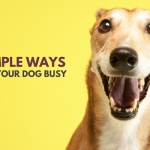 Did you know that dogs get bored with their stuff just like we do? Researchers tested them a few years back, and they found that when dogs were presented with two items — one new and one old — they show a strong preference for the new one. So if you’re dog is bored with their toys you’re not alone — it happens to all of us. So what can you do to keep your dog interested in their toys? Well, there are a few simple ways to help. 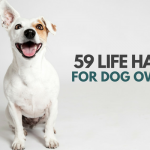 Here’s how to keep your dog from getting bored with their toys. I love seeing the excitement on Laika’s face when I come home with a new toy. The trouble is that excitement doesn’t last. She’ll play with it for 5-10 minutes, and then she moves on. Do you want your dog to get excited about their toys just like they did the first time you gave it to them? Try putting it away for a week or two and then presenting it to them. You’ll notice that the “newness” in any toy comes back after your dog hasn’t had access to it for awhile. My dog has a lot of toys; way more than she could possibly use every day. When I leave them all out for her she’ll grab one, move it a few feet away, and then move onto the next one. The problem is she doesn’t stop to actually play with any of them — she just gets stuck in the “I don’t know which one I want to use” mindset. It’s like doggie analysis paralysis; too many options leave her indecisive. So what I do is rotate her toys every week (you can do every couple of days if you prefer). I give her access to 4 or 5 toys each week, and I leave the rest in her toy box. Every week when I switch our her toys she gets excited — just like she did when she got them for the first time. If your dog has a favorite toy feel free to leave that one in rotation at all times. For Laika it’s her glow ball; it’s the one toy she never gets bored with (I think it’s because it makes a cool squishy sound every time she bites down on it). The rotation technique helps keep your dog interested in toys they get bored with — it’s not necessary for the ones they use all the time. If your dog is bored with their toys start thinking about ways you can make them more interactive. Can you use that toy in a game of fetch? Can it be used for tug? Can you put some yummy treats in it? 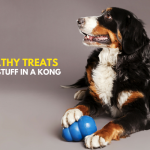 Find ways to make those toys your dog finds boring more engaging, whether it’s through human interaction (a game of fetch) or yummy treats (stuffing a Kong). Pick up their ball and start bouncing it around, and watch as it immediately peaks their interest. That’s the strategy I used to teach my dog to catch. I played “puppy in the middle” with a friend to get her interested in the ball we were tossing around. It only took a few tosses before she was jumping in and catching the ball herself. If your dog has a chew toy they never touch try putting a dab of peanut butter on it and encouraging them to use it. Pick up that stuffed toy that’s been sitting on the ground for a few days and invite them for a quick game of tug. Stuff some yummy treats in that Kong that’s sitting in their toy box (bonus points if you freeze it overnight to make it last longer). Not all toys are created equal when it comes to entertaining our dogs. Some dogs love chew toys, while others find them dull. Some dogs love anything that bounces, while others prefer stuffed animals. (if your dog destroys stuffed toys make them a DIY restuffable dog toy) Some dogs love toys that make noise, while others could care less. Figure out what sort of toys your dog prefers, and which ones they find boring. And when it comes to getting your dog new toys focus on ones that you know will able to hold their interest for more than 5 minutes. 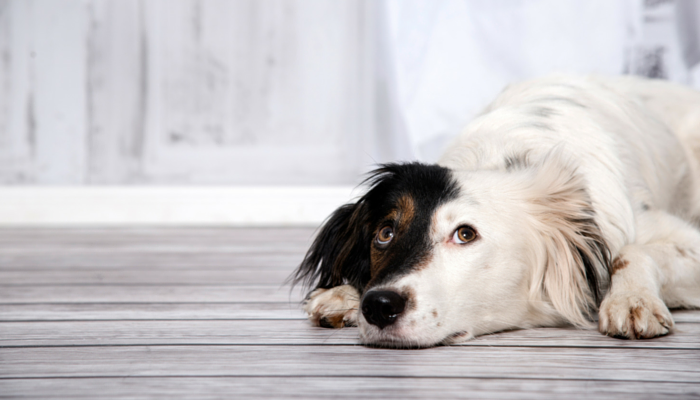 Does your dog go bonkers for anything that squeaks? Do they love anything that smells like food? Are they obsessed with anything that has stuffing? Will a chew toy keep them busy for hours? Do they love toys that bounce? Don’t be like me and buy 10 different chew toys thinking you’re finally going to find the one your dog actually likes. It never happened, and I’m embarrassed that it took me so long to catch on. So now I’m left with 10 toys I have to “flavor” myself with peanut butter or broth to try and keep her interest in them. If I was smart I would have realized sooner (and stopped after buying chew toy #3) that my dog just isn’t that into chew toys. Focus on quality rather than quality. You can make old toys “new” and exciting again by rotating them, but it’s nearly impossible to hold their interest in a toy that they never cared for to begin with. 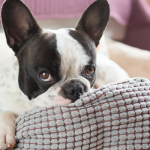 Does Your Dog Get Bored With Their Toys? Does your dog get bored with toys after awhile? How do you keep them interested? Does your dog have any favorite toys that they never get bored with? This post contains affiliate links, if you make a purchase I’ll earn a commission. For more information please see our disclosure. I don’t think my dog could ever get bored with a toy – but I think that’s mostly due to the fact she’ll destroy a toy before she ever gets a chance to get bored in the first place. My dog is the same way so I made her a restuffable one and it’s awesome. My dog gets bored with the small ones but for bigger toys he tend to last even days playing with it.